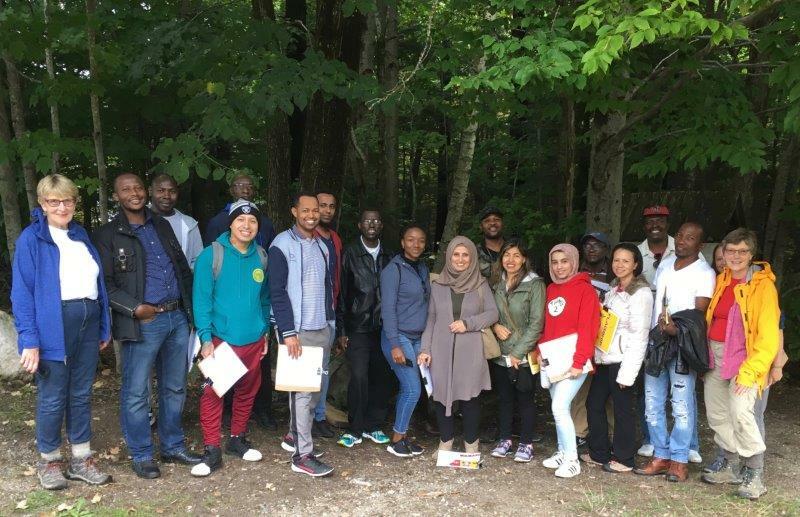 This fall, three classes of English language learners learned about the nonprofit group Portland Trails and its work to create a network of trails throughout greater Portland. Lois Winter, a trail steward and advisory board member of the group, led the classes on field trips to the Presumpscot River Preserve and the Fore River Sanctuary. FPAE paid the cost of the two trips. This article was written by Nancy Fox’s ESOL 4 class. When we learned about trails in Portland we talked about Presumpscot River Preserve. We were very excited to discover it and enjoy our trail in Portland. Last Thursday our class went to field trip at Presumpscot River Preserve. We went to visit and learn about Portland Trails. We learned about trees, flowers, mushrooms, leaves, moss and the River. We saw stream, tall trees, tree leaves, tree bark, mushrooms, flowers, pine cones and acorns. We heard birds sing. We smelled the natural air. Then we touched berries, bark, acorns and lichen. We saw the river. It was flowing slowly and curly water. We heard the river’s sounds and bird sounds too. We learned that 100 years ago the river was not good because of the pollution, but now we have clean river. We heard waterfalls that made a lot of noises. At the falls the water was falling very quickly. Also the water became white because there are many rocks and the water made bubbles. The water made sound like the noise of wind. On this field trip the most we like was trail and beautiful natural environment. We felt very excited and everyone was happy about the Portland Trails. The time we spent there was short and exciting, so we hope to return again to discover a lot more things. We would like to return to this preserve on our own. 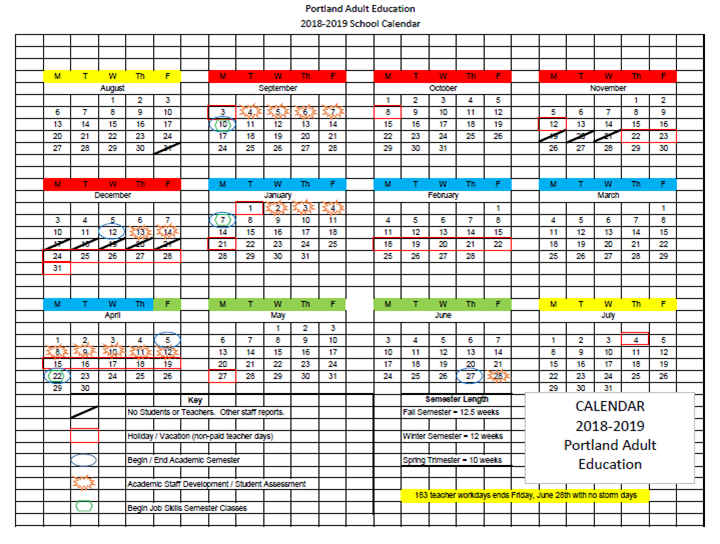 With funding from FPAE and Sam Cohen Foundation, Portland Adult Education was fortunate to launch a Learning Lab in March 2018. 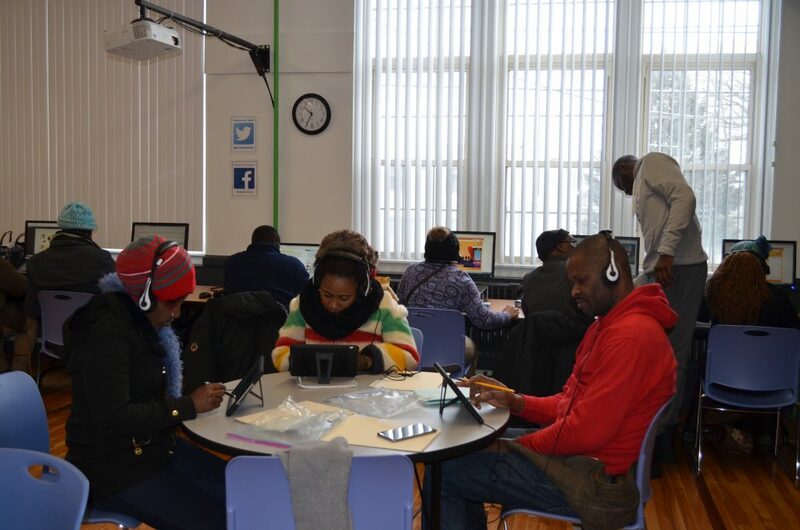 The lab serves students whose prior experiences, schedules, or learning styles have prevented them from obtaining high school credentials or preparing for college. The Learning Lab offers online tools, academic support, and one-on-one relationships that help students feel a sense of community and stay motivated to achieve their personal learning goals. Since March, over 85 students have visited the lab to study at their own pace for the HiSET and ACCUPLACER exams and to talk with staff about planning for the future. FPAE is thrilled to announce that since the Lab’s opening 4 students have passed the HiSET, 4 students have passed the ACCUPLACER, and even more students are getting closer to passing these tests! Thanks to funding from FPAE, the Learning Lab was was able to offer consistency of service to students by remaining open for six weeks this summer, a time when most students do not have access to summer classes. The Learning Lab staff is currently working on improving goal setting and individual learning planning offered to students, building an online community where students can share information, and expanding volunteer matching for students who wish to have one-on-one support while working in the lab. 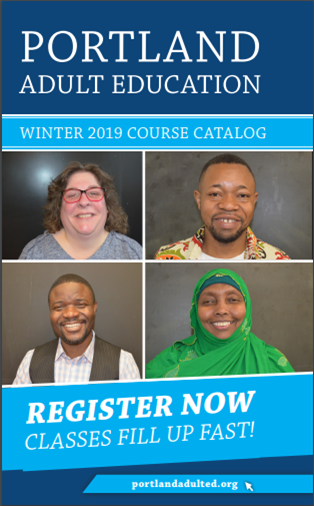 Additionally, as part of a grant through United Way Greater Portland, PAE staff will work with adult education providers across Cumberland County to share ideas, professional development opportunities, and marketing strategies to improve lab offerings county-wide. Portland Adult Education (PAE), Eyecare Medical Group, Maine Lions Club and Friends of Portland Adult Education provided free vision screenings and eyeglasses to PAE students on Saturday June 23, 2018. 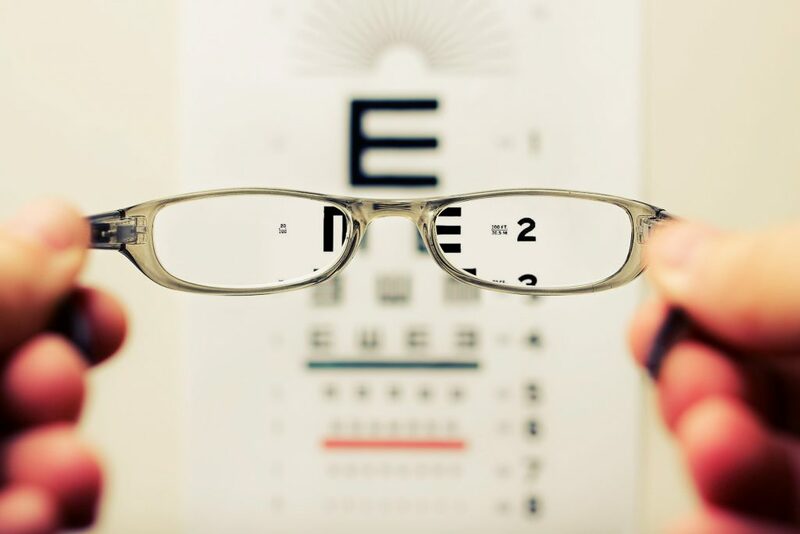 Approximately 30 adults who do not have health insurance or other resources were screened by volunteer doctors at the Eyecare Medical Group at 53 Sewall St., Portland. Students were able to get free glasses thanks to Jane’s Vision Fund, established in memory of past Yarmouth Lions Club • Maine president, Jane Cleaves. 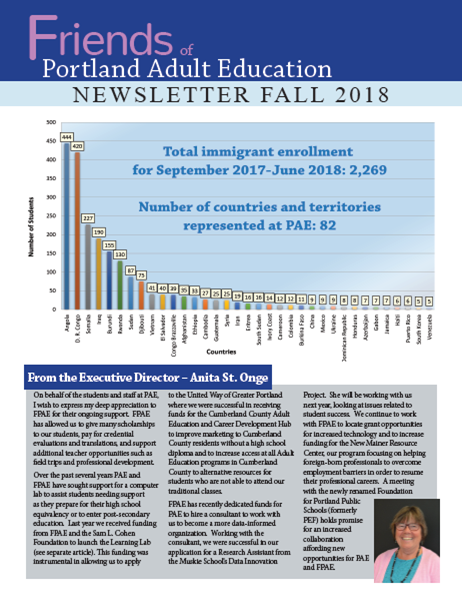 PAE provides English and job skills classes to more than 2000 immigrant adult students each year. Vision problems affect about 20% of PAE’s student population. With proper vision, students are able to more quickly acquire English skills needed to participate in the Portland community and find jobs.